To help you avoid unwelcome surprises and unexpected fees at the airport, we’ve brought together all the information regarding the different baggage policies of the most popular regular and low cost airlines in the US. Weight, size, number of pieces allowed and cost of excess baggage – we’ve got you covered. As if that wasn’t enough, we’re also sharing our advice on how to avoid paying for excess baggage and running through the items not allowed on board your flight – because it always pays to be prepared! Each company has its own rules and regulations regarding baggage allowance. In general, the passenger must be able to stow their luggage in the overhead compartment or under the seat in front without problem in order for it to be considered suitable cabin baggage. 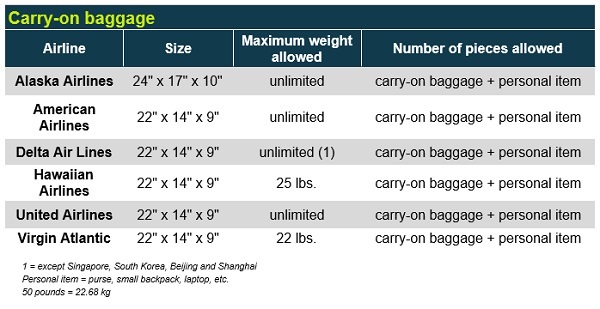 All regular airlines allow one item of carry-on baggage, of varying sizes (from 21.5 ” x 15.5 ” x 9 ” with Air Canada to 24 ” x 17 ” x 10 ” with Alaska Airlines) with an allowed weight of between 15 lbs with Singapore Airlines to unlimited with a number of regular airlines such as American Airlines and Delta. It is the domestic airlines which have a higher cabin baggage allowance compared to that of international airlines. Tip: the majority of regular airlines also allow the passenger to bring one further ‘personal item’ on board (a laptop, purse, handbag…) as well as their cabin baggage. 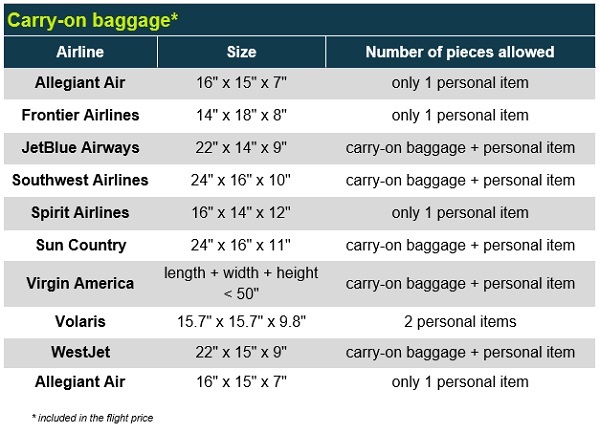 On flights with regular international airlines, checked baggage with a maximum weight of 50lbs and a maximum size of 63 inches (length x height x width) is always included in the price of a ticket for international routes. Airlines including Air Canada, British Airways and Air France all offer the first checked bag for free when traveling internationally. On domestic journeys, the price of checked baggage is $25 for the first bag with the exception of Virgin Atlantic, which offers the first checked bag free of charge. 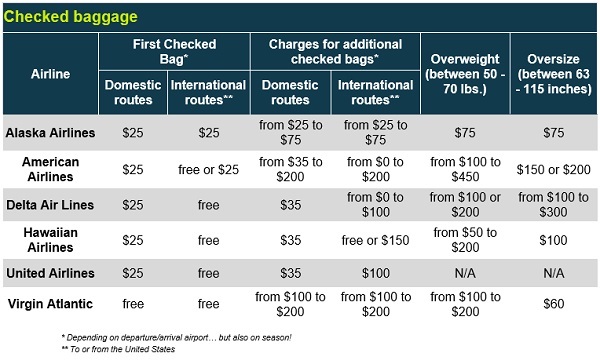 National airlines also offer the first bag free on international routes, with the exception of Alaska Airlines and, depending on the route, American Airlines, both of whom charge $25 for the first checked bag. When flying with a low cost airline, one small item of carry-on baggage, classed as a ‘personal item’, is always included in the price of the ticket. Personal items are smaller items including laptops, purses or handbags and can have dimensions of up to 24″ x 16″ x 10″. Low cost airlines including Allegiant Air, Frontier Airlines and Spirit offer just one personal item in the ticket price. Additional, larger carry-on items must be purchased in advance. It is also worth nothing that from 4/3/2017, maximum dimensions for a personal item with Spirit Airlines are 18″x14″x8″. Larger carry-on baggage items can measure up to 24″ x 16″ x 11″ depending on the airline. JetBlue Airways, Southwest Airlines, Virgin America, Sun Country and WestJet offer one carry-on item as well as one personal item with an economy fare ticket. Alternatively, Volaris offers two smaller personal items in the ticket price. Tip: If the size of the carry-on baggage is larger than the maximum dimensions, it will be counted as checked luggage and a fee will apply to check it. To avoid extra fees, ensure your baggage is within the size limits specified or purchase extra baggage allowance in advance. With low cost airlines, checked baggage is very rarely included in the price of a ticket. The exception is Volaris which offers one checked bag with an economy ticket, and Southwest which offers two checked bags with all tickets. 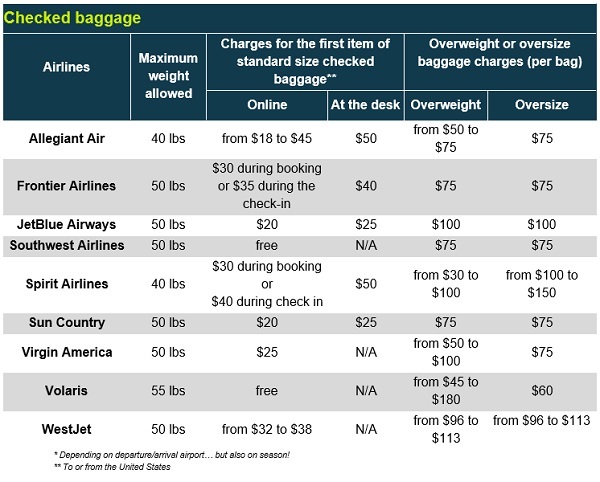 With the exceptions of Allegiant Air and Spirit Airlines who allow 40lbs, and Volaris which allows up to 55lbs, the maximum weight allowed is 50lbs. Purchasing checked baggage online during booking is the cheapest option, with prices ranging from $18 to $45 with Allegiant Air. The average cost is between $20 – $30. It is highly recommended to purchase checked baggage in advance, as this is the most budget friendly option. > If you’ve got too much in your checked baggage, move it to your carry-on bag to avoid paying unnecessary fees at the airport. Carry-on baggage often comes with must less strict weight limits! > Check postage prices: it can be cheaper to send items home than to pay for extra baggage on your flight. The import of perishable goods, such as food and plants, may be forbidden or strictly controlled depending on the country. To find out more, passengers should consult with the customs services in the destination or transit country.